To live in my house, you must love garlic. And in this case, lemon. 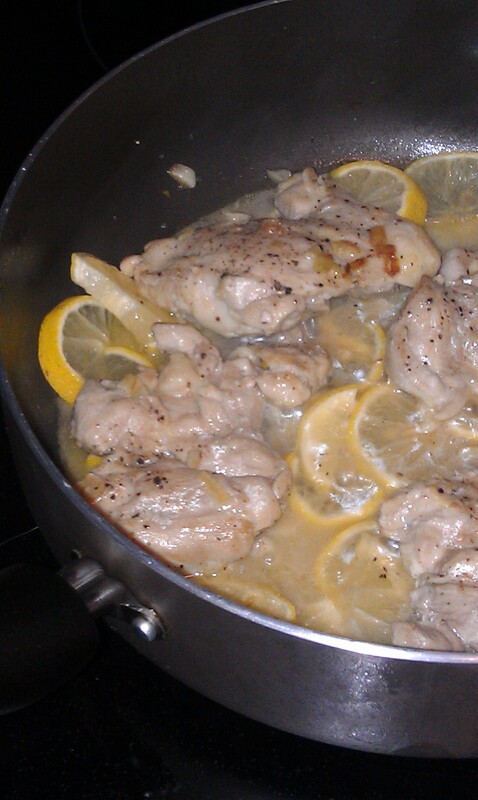 My adventurous side came out and I decided to exercise my “portion control” by virtually steaming chicken thighs in lemon juice. That is, after it seared in garlic oil. Yum. 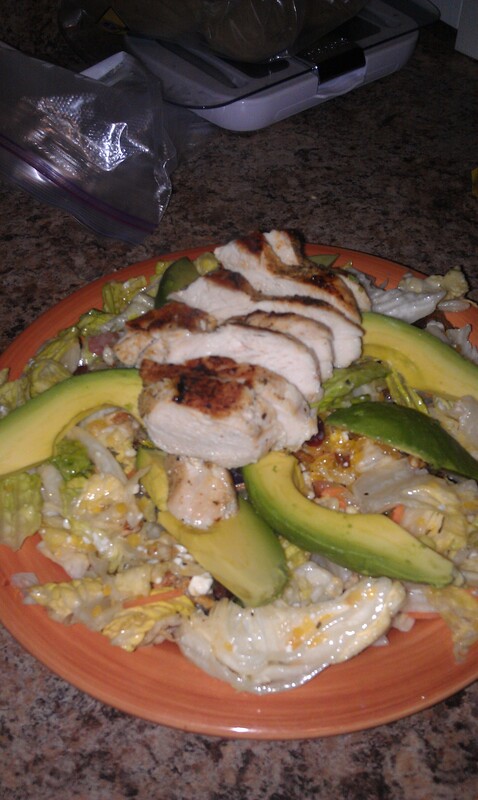 And then served it with a monstrous salad with minimal dressing. When everything tastes good solo, it barely needs to be a dressed up. Put the olive oil in a hot pan (medium heat), warm it up for a second and add the garlic. Let it go until it is fragrant, about 1 minute. And longer and it will burn. Salt and pepper one side of your chicken to taste, then put in the pan seasoned side down and season the other side. Sear for a couple minutes – chicken thighs are typically thin and cook quick. After a couple minutes, flip, add in your lemon slices, and cover. Turn heat to medium-low. Let cook for about five minutes and flip. Cook about another 6-7 minutes covered. your lemon juice should be fragrant and seeping out into the pan to boil. Take the cover off and check. If needed, keep the cover off and cook for one to two minutes more to finish. Serve with a ginormous salad. Remember protein should only be the size of your fist to be a proper portion! My salad had tomatoes, mushrooms, avocado, a pinch of sea salt and about a tablespoon of olive oil and balsamic vinegar. Delicious. And less than thirty minutes. Yet another family tradition that only started a few years ago is picking the scrumptious lemons off our family’s tree in the backyard and making lemon meringue pie. Oh and is it good. The lemons are so fresh that the pie is good and tangy. I’m sure it’s fun to watch me attempt to make meringue too…getting that white stuff to “stiff peaks” just sounds dirty. My grandpa likes it, and so do I, so it’s all good, and a special treat considering we only make it the one time a year. 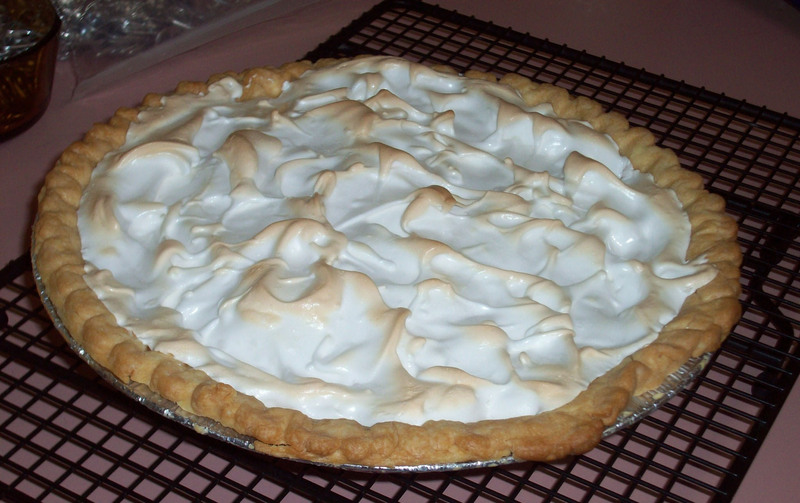 I have to say, lemon meringue pie is about the only kind that I’ll eat, next to key lime pie and chocolate mousse. The recipe we used came off the side of the corn starch box, which came from Kroger – just to make sure we give credit where credit is due. I bet that it’s been the same recipe since the 50s, too. How awesome is that?